The other day as I was out running errands, I felt the call of the thrift. If you’ve never felt that call before, it’s hard to describe. It’s a gut feeling that if you don’t go to the thrift store right there and then, you will miss out on something that needs to come home with you. I have a love/hate thing for the SPCA Rummage Sale Store, but I found myself pulling into the parking lot Wednesday afternoon just as a parking space magically opened up. Clearly, the fates were aligned. 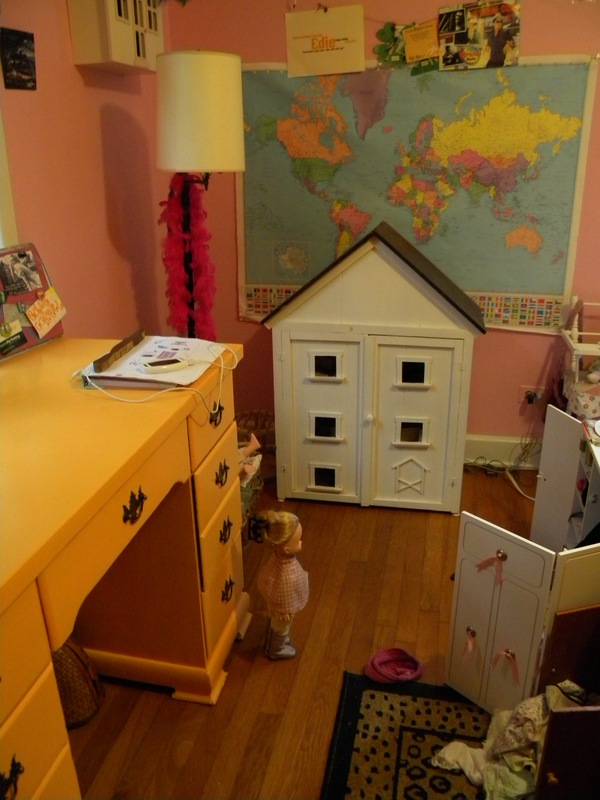 Since rearranging Edie’s room to accommodate a new to her desk that I revamped for her, I noticed the corner by her dollhouse needed something on the floor. Being the cheapskate thrifty shopper that I am, I hoped that I would find something that worked with the existing pepto bismol pink walls, leopard print rug and new orange desk. The map on the wall pulls it all together. Anyway. I felt the call of the thrift. In my mind, I wanted to find a $10 rug that worked in that corner. Ever since my ultimate thrift dream came true a few years ago, I don’t think anything is impossible anymore – it might just take some time. Low and behold, I found it. A hand hooked folk art masterpiece for $12.99. The price was slightly over what I had set in my mind, but this was not some mass produced cheap rug – this was a hand made piece, in relatively good shape that was so over the top bizarre, I couldn’t leave it there for anyone else. Click on that photo and give yourself a good eyeful. For starters, it’s orange. It’s got a squirrel. It’s got wild pheasants that are pretty amazing in detail. True, the reindeer are completely out of proportion and at least one of them looks like a rapid dog that is about to attack. There appears to be a small goat that is smaller than the pheasants hidden in the midst of those miniature pine trees. The clincher was the red fringe sewn around the outside edge. I was worried Edie wouldn’t like it, but turns out she does! Something about the color orange and the overall bizarreness of it I think. The animals are a little bit clearer from the back side. It appears to be primarily made of cotton and not wool. It is in relatively decent shape, although it does need some cleaning and restoration. I have it sitting here on the floor next to me and every time I look at it, I find a new detail I’d previously overlooked. What you can’t see in the bright day light is that the orange background is actually several different shades. There were other scores that day as well – a very nice Lilly knock off skirt for Edie, a new orange apron for me as well as a knitting book I’ve been looking for for some time. But that rug is the score that made me the happiest. When the thrifts call, you gotta answer. Maps always make the best wall coverings. And I feel the same call when I drive past Habitat Restore–there might be something awesome in there that I shouldn’t miss! What a great find! 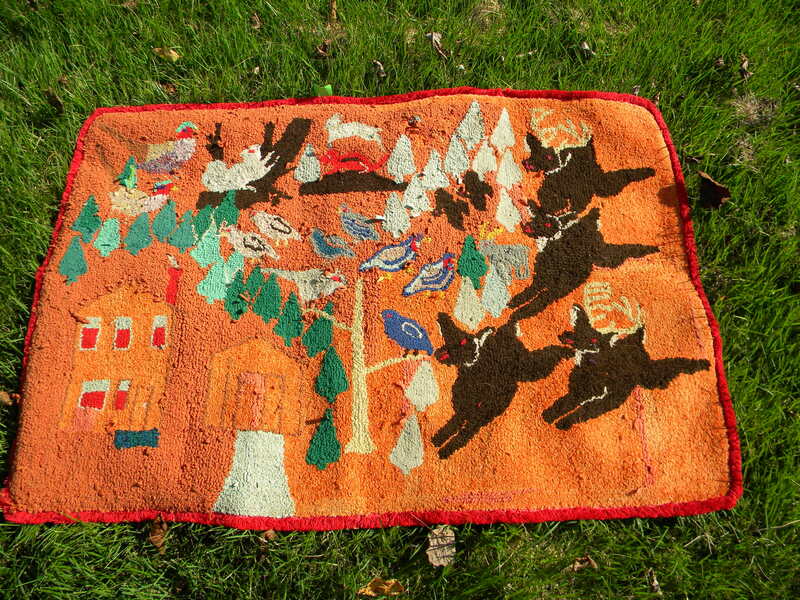 I love hand hooked rugs. I do too! It’s one of those things I think I’d like to learn how to do one of these days – if only because I have a gorgeous book full of patterns for them! Funny, my elder daughter and I have been feeling the call to head over to the SPCA shop lately too. You have to answer the call. 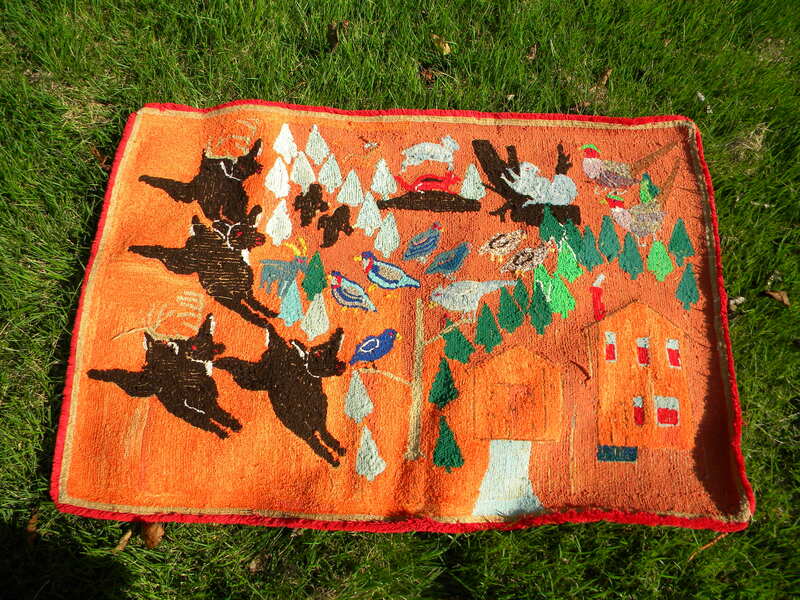 Hopefully it was not for the “When Reindeer Attack” rug as I’m calling it.